Tennessee Gov. Bill Haslam proclaimed Dec. 23, 2017 as a day to remember Captain Tom Ryman, and to celebrate the 125th anniversary of the historic Ryman Auditorium. 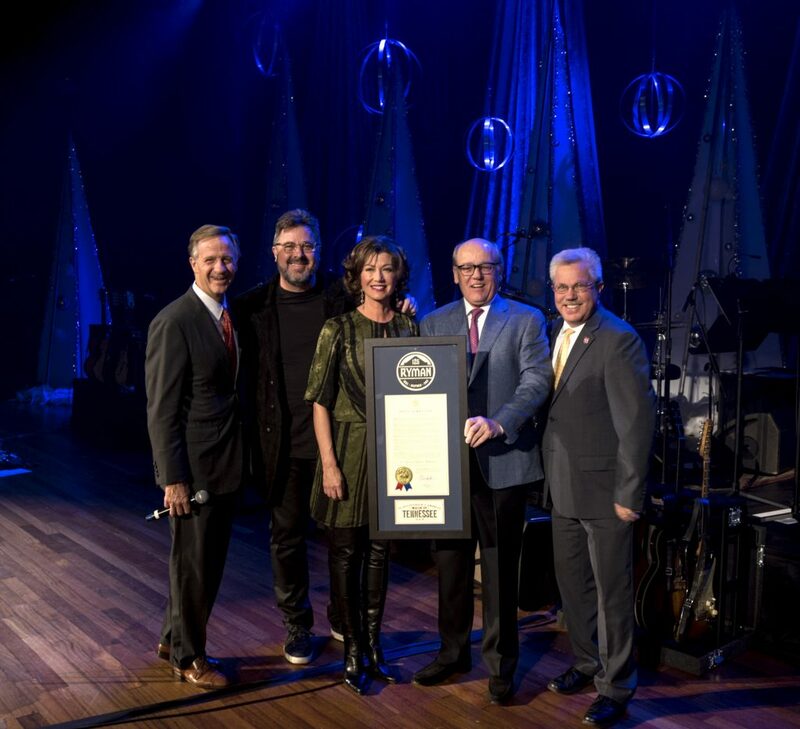 Haslam presented a special framed proclamation to Ryman Hospitality Properties, Inc. CEO Colin Reed during Vince Gill and Amy Grant’s Christmas concert last night at the historic Ryman Auditorium. In May of 1885, Nashville riverboat captain and entrepreneur Thomas Green Ryman heard Rev. Sam Jones speak at a tent revival near the current location of the Ryman Auditorium and was inspired to build a grand tabernacle, where all would be welcome to worship. In 1892, 125 years ago, the Union Gospel Tabernacle opened for events that included sermons, lectures, conventions and performances by the renowned Fisk Jubilee Singers. While delivering the eulogy at Ryman’s funeral on Christmas Day in 1904, Reverend Sam Jones suggested the tabernacle be renamed Ryman Auditorium. The beyond capacity crowd offered their unanimous consent with thunderous stomping and applause according to newspaper accounts of the day. The auditorium, world famous as home to the Grand Ole Opry from 1943-1974, has hosted a variety of the greatest entertainers and speakers of each generation for 125 years. The Ryman exhibit “Inspired: 125 Years of Performance” showcases attire from Johnny Cash, Little Jimmy Dickens and Little Big Town; guitars played by Jack White and Vince Gill; long-time Ryman manager Lula Naff’s collection of playbills. One of the highlights includes the Bible used on May 10, 1885 by Rev. Sam Jones. Visitors can get to know the stories with short films hosted by Emmylou Harris, Marty Stuart, Nicole Kidman, Ricky Skaggs and Trisha Yearwood as they take you through each chapter of the Ryman’s story. Keeping with the tradition of hosting world-class acts and aspiring artists, the Ryman will play host to Old Crow Medicine Show on New Year’s Eve, Kelsea Ballerini on Valentine’s Day and Margo Price for three shows in May, among many others in 2018.